Use the activities in Lesson 47 in the Handbook of Nature Study to learn more about frogs. Use this notebook page to record your spring pond study observations and then revisist your pond in each season to compare plants, insects, birds, fish, reptiles, and amphibians. 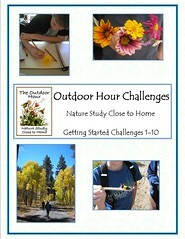 If you already own the Getting Started ebook, complete Outdoor Hour Challenge #10. Take a picnic lunch to a near-by pond and combine your frog study and a little pond study after you have a little something to eat. Food always tastes better when you eat it outdoors! Use the notebooking page in the ebook as a follow up to your outdoor time if you wish.